A journeyman sailor spends over a year before the mast in a circumnavigation of the globe. In 1997, the Picton Castle, a three-masted ship, traveled from Nova Scotia and back again via the Panama Canal, Tahiti, Zanzibar, and other exotic locales. Half its crew of 20 or so paid more than $30,000 to participate in the adventure. Others, like first-time author Crockett, signed up for meager wages. Crockett describes jibs, topsails, royal yards, main lower shrouds, and other minutiae with the reverence of a guide leading tourists through a medieval cathedral. Problem is, unlike a tour guide, he doesn’t define his terms, often leaving laypeople to wade through impenetrable nomenclature: “Her impressive rig was now catching the wind, heeling the ship as if she were sailing that breeze under lower topsails.” More engaging is the portrayal of life at sea among crew members—their grousing, romances, and varying work ethics lead a reader to conclude that little has changed since the 19th century. The crusty captain and first mate demand that orders be followed as in the military, a policy that grates against fare-paying passengers, who signed up to tie knots, enjoy sunsets, and feel the wind against their faces, not swab decks and paint railings. At times, it feels as if a mutiny is afoot, but that danger recedes as angry members of the crew quit the voyage at the various paradisiacal ports where the ship calls. The paradises provide rich diversions for the reader, too. Scenes of islanders rowing up to the ship in dugout canoes, surfers in the Galápagos laughing at the crew’s antics, and Polynesians giving the author a tattoo are welcome respites from the painstakingly detailed account of working a sailing ship. 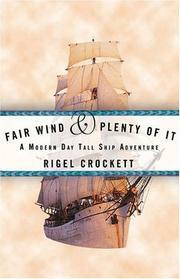 Anyone who regularly hugs the coast in a smaller craft will enjoy Crockett’s tale and find reason to envy him. Others will wait to see the movie.